is a second generation Moe Toys shopper. Her name is Fyre Star's Heavenly Option but she goes by Isabela & Izzi. Her mother is the very clever and talented Heaven's Graceful Princess, RA NAP NJP NA OAJ NF CGC CL3-R CL2-F CL2-H CL2-S DNA-VP.Grace has been shopping with us at the agility trials. We are very thankful to have the Fyre Star Australian Shepherds as our friends. Here is a picture of Izzi's mom Grace in action. Izzi is doing great in her new home and we look forward to seeing her in the future! 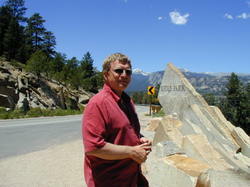 A Great Big Thank You to Rich!!! It has been a long hot weekend. I started out the weekend by being at The Labrador Retriever Club of Southern California Specialties on Friday and Saturday. I have done those shows since the beginning so it was great to see some old and make some new friends. On Sunday I was supposed to go and help Rich at the Lake Mathews Kennel Club show. Sunday morning I woke up late and was wondering where Rich was since we needed to leave for the show. I called him on the cell phone and he told me that he was already at the show getting ready for the day. He watched TV the night before and saw that the temperature was going to be over a 100 degrees and didn't see any point in my going, so he gave me the day off! Not only did he suffer in the heat alone, there was also a fire at the show grounds and he had all kinds of smoke and ash to deal with. Thank You Rich ~ Your Wife Appreciates You! 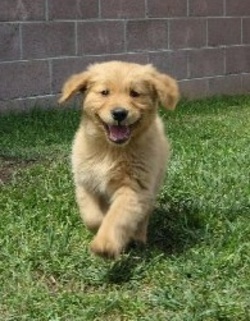 This adorable 8 1/2 week old Golden Retriever is the newest member of the Canine Angels. He is being raised by Kerri and Henry. I know that this little cutie is going to be a star! Wawahki Celebrates Easter Weekend With 3 New Puppies! Wawahki, a Xoloitzcuintle, gave birth to 3 precious puppies over Easter Weekend. Mother and puppies are doing well. 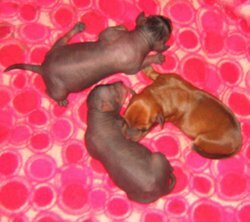 First out was a hairless girl (9 oz), second a red coated male (10 oz), and lastly was a black hairless male (11 oz). We are super excited for our friend and neighbor Debra. Those of you in Southern California know Wawahki and Debra from the obedience rings. 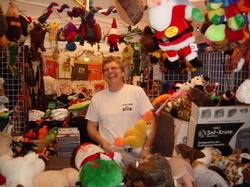 And Debra has helped out several times in the Moe Toys booth, including at Eukanuba. Last Saturday was really exciting for Rich and I. We got to attend the Canine Angels Open House. 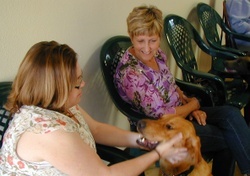 Canine Angels is a support dog training group and has members from Southern California to Oregon. We have loaned them the Moe Toys warehouse for their meetings and puppy training classes, so it was really exciting for us to get to meet the people and the dogs that participate in this wonderful program. Happy Valentines Day To Everyone!!!! And especially to Rich, the Man of Moe Toys. Here he is at the Eukanuba Dog Show 12/07. You can tell that this is a guy who really enjoys his work!! Can You Smell The Coffee??? One of the best things about my job is all of the great people that we get to meet. One of them is Marian Solomon and her wonderful Portuguese Water Dog Wizard. 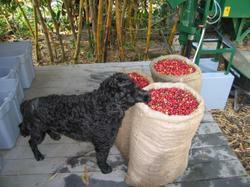 Marian and Wizard left California and moved to Hawaii to start the Hualalai Mauka Coffee Company with Mike Renner. 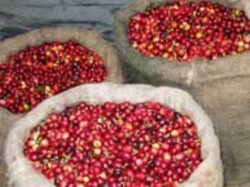 Their very special Kona coffee is grown in volcanic soil, the beans are hand picked and then dried in the Hawaiian sun. Sounds perfect to me! 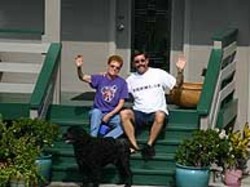 You can visit with Marian, Mike and Wizard at http://hualalaimauka.com/. As you can see, Wizard takes his job as a coffee bean inspector very seriously.